The FMX trailers are traditionally created by students of the Institute of Animation, Effects and Digital Postproduction at Filmakademie Baden-Württemberg. 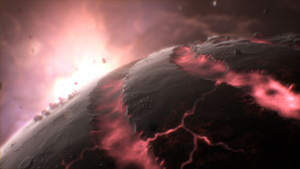 The 2012 trailer “Globosome” was created by Sascha Geddert and his team. In the vastness of space, there’s a small speck of rock inhabited by the most peculiar life forms: Dark little dots that start to replicate fast and begin to show signs of intelligence. Globosome tells the story of the rise and fall of these little creatures. The film is completely realised in 3ds max in Stereoscopic 3D. A vast collection of Plugins was used for rendering, atmospherics, plants and the control of thousands of jumping dots. Controlling the crowds was one of the most challenging aspects of the film together with the sheer amount of work caused by the depiction of a world in constant transformation.